1. Use our Amazon WishList to choose your gift for our kittens. 2. Use one of the links below to go to Chewy's. Their pricing on some of the cat foods are significantly lower than using Amazon and we'd rather you save money while your gift can have the biggest impact. PLEASE KEEP IN MIND WE'LL BE HAPPY WITH ANY SIZE CAN FROM 3 OZ TO 12 OZ! Mighty Macaroon is mighty hungry! Secret Agent Pudding is hoping to be on the case...of cat food! 3. 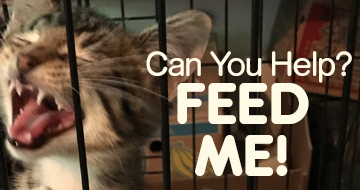 Make a Gift HERE of any size so we can use it for Vet care or anything else our kittens need to be happy and healthy. We also just got our first Target Gift Registry! set up! So when you shop for yourself, you can add a few goodies for our kittens! Our goal is to get at least 30 cases of cat food THIS WEEK. Please be part of our rescue team and join us in saving lives! Thank you!